Of course Microsoft's new touch-crazy OS doesn't make a whole lot of sense without a touch screen, but you can spend most of your time in traditional desktop mode anyway. 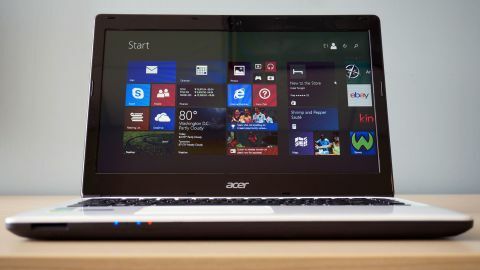 And thankfully, Acer's obligatory glut of bloatware – Acer Media, Acer Photo, Acer Quick Access, Acer Games, Private Wi-Fi, and more will assault you, begging for registrations – isn't too difficult to get rid of. The E1 is fine for day-to-day tasks like watching Netflix, streaming music from Spotify, word processing, surfing Reddit and Facebook, and even some basic photo editing. If you want to cut HD video or compose symphonies, you're probably not looking at a budget-priced laptop anyway. Unfortunately, "adequate" is too accurate an adjective in most situations. Want to watch something on Netflix? OK, but the resolution (1366 x 768) on that 14-inch LED screen isn't great, the colors have little depth, the contrast could use a boost and be careful with that viewing angle. Don't even think about using the E1 outdoors, though that's no surprise. Oh, and try to prop the laptop up on something, because its tinny, mediocre stereo speakers are bafflingly located on the bottom of the frame (making Spotify sound like AM radio). Interestingly, while the Aspire E1 won't play more graphically taxing games at all, its discrete Nvidia GeForce GT 820M is capable of supporting medium-intensity 3D games like Terri Vellmann's Heavy Bullets. It's not Battlefield 4, but the colorful first-person shooter ran flawlessly on the Aspire E1. Notably the trackpad has some additional flaws that affect minute-to-minute use (as if scrolling wasn't bad enough). For one thing, while it's possible to turn off the tap-to-click function (I personally can't stand it), there doesn't seem to be a way to do the same to the "tap-with-two-fingers-to-right-click" function. The same goes for a strange feature that opens Windows 8's Charms menu – you know, settings, search, devices, etc. – when you move a finger from the right edge inward. I did this constantly by accident, and could find no way to deactivate it. It's as if Alps only wrote half of the touchpad preferences pane and then forgot about the rest. It's maddening. However the Aspire E1 does have some very nice touches on the inputs/outputs front. It's always nice to have three USB ports – two 2.0, one 3.0 – and who could complain about HDMI out, a physical ethernet jack and Bluetooth 4.0? And the convenience of a 500GB hard drive should not be discounted, particularly with the lack of a disc drive (come on, when was the last time you used one?). An SD card reader is the cherry on top. Travel back up the page a bit, and you'll find a worrying sub-3 hour battery benchmark. Sadly, the Aspire E1's 2,500mAh battery is another of its compromises. That's smaller than the Samsung Galaxy S5's 2,800mAh battery. Think your laptop might use more power than your phone? The manufacturer gives it a max of 4 hours run time, and that's generous. In fact the benchmark proved satisfyingly accurate: in my testing, the battery lasted almost exactly two and a half hours before the E1 hit 5% and shut itself down. Those scant hours were spent with the brightness and volume up, browsing in Google Chrome and writing in WordPad, downloading and installing apps (Spotify, Steam), checking Reddit, tweeting, and watching two episodes of Malcolm in the Middle on Netflix. In other words, normal usage. Amazingly, the Aspire E1 actually takes longer to charge – about two hours and 50 minutes, in my testing – than it does to fully expend that charge through normal everyday use.